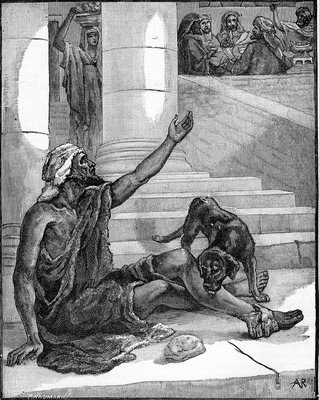 On my effort to make all of my past homilies available on line, I'm adding this one on the parable of Lazarus and the rich man. I preached this homily last year around this time, which happens to be the beginning of the Football season. By know most people at St Michel's know that once the "grid iron" starts a little bit of Redskins mania always finds its way into my homilies... enjoy... oh yea, one more thing... Go Skins! What I mean is that the story of Lazarus and the rich man is a story that almost everybody knows by heart: There is Rich man- and there is a poor man, When they die each one of them gets their just reward: rich man goes to the netherworld (A very unpleasant place), but the poor man goes to duel with Abraham. I mean…“How difficult could it be to talk about this stuff?” The Rich should help the poor, the poor has human dignity, Social Justice…Good, 8 minutes tops, and we’ll be home before kick off! But when we start reflecting on what the reading actually says and we start noticing little things, like for example, why are we never told the rich man’s name? The only thing we are told is that he dressed in purple and dinned sumptuously but we are never told who he was….Is it, because it is more important for us to know what kind of life this man lived? A life we can all relate to? Or at the least the type of life we all aspire to? A life very different to Lazarus’s life which was full of pain and suffering. The type of life we all try to avoid, or at least not think about to much? Another thing we are not told is if these two men knew each other… What we know is that that Lazarus spent his days at this man’s door steps so at the least he had an idea of who lived in this house. On the other hand we can conclude that this rich man knew about Lazarus because of the way He and Father Abraham talk about him. So… Although we are never told, it is obvious that their paths must have cross more than once. There is lot in this story that is left to the reader’s imagination. But the most important fact that we are never told is this: Why does this rich man end up in the “Netherworld”? …Why is he sent to a place of torment and fire? We are never told that he mistreated or abused Lazarus in any way and been rich in it self is not a sin! What was this rich man’s great sin? At the end of our analysis we are left with a feeling that although this rich man knew of Lazarus, and of the hard life he was living, he was indifferent to Lazarus suffering. Right now you might be thinking “ok here it comes, the social justice punch line” and don’t get me wrong, social justice is an important theme in this reading, we can spend a whole series of homilies talking about the responsibilities those with more resources have towards those less fortunate, but I think today’s message goes deeper than that. To understand this message we should start with a simple statement: suffering is a fact of life, we all suffer. Regardless how wealthy or how poor we are, how young or how old, we all experience pain, injustice and loneliness. The poor, the hungry and the sick experience very visible forms of suffering, but for the kid that feels he is not good or cool enough at school, for a teen that struggles to be accepted, for a mom or dad overwhelmed by their children’s problems, for a grand-ma and grand-pa struggling with old age, their pain, our pain is as real as Lazarus pain of having to let dogs lick his sores. It is because of this that we like to think that pain is something that happens to other people, far away. But the moment we are confronted by the pain and suffering our first reaction is to close our eyes, and practice avoidance. Those are the time when we tell ourselves “do not make eye contact, it will go away”. Jesus is telling us today that as Christians we can not go thru life ignoring the pain that happens at our own doorsteps. What this rich man did… this man’s great sin; was not that he abused Lazarus in any way, but that to him Lazarus suffering was invisible. I can tell you from experience that staring at the suffering of others is not an easy task. What can you say to family that has lost a love one? Or a man or woman that is unloved? A child is been bullied? What can you say that will make the pain go away? Nothing, the only thing we can do is follow the example of Jesus on the cross. Embrace this suffering and let this person know “I will suffer with you, I will suffer for you”. My brothers and sisters, it is easy to make the mistake to think that today’s Gospel is about the suffering of those that live far away from us, in the inner city, in homeless shelters, but if we do not see the suffering that is at our own door step, Aren’t we as guilty as the rich man from the story? Many years ago blessed Mother Teresa of Calcutta was told by a young man that he wanted to abandon everything and follow her to the streets of Calcutta to help the poor, her answer resonates with today’s gospel "Stay where you are. Find your own Calcutta. Find the sick, the suffering and the lonely right there where you are -- in your own homes and in your own families, in your workplaces and in your schools. ... You can find Calcutta all over the world, if you have the eyes to see. Everywhere, wherever you go, you find people who are unwanted, unloved, uncared for, just rejected… completely forgotten, completely left alone." I have to tell you my brothers and sisters some Sunday Gospels are truly gifts from heaven.